Well, this is a rather strange album. 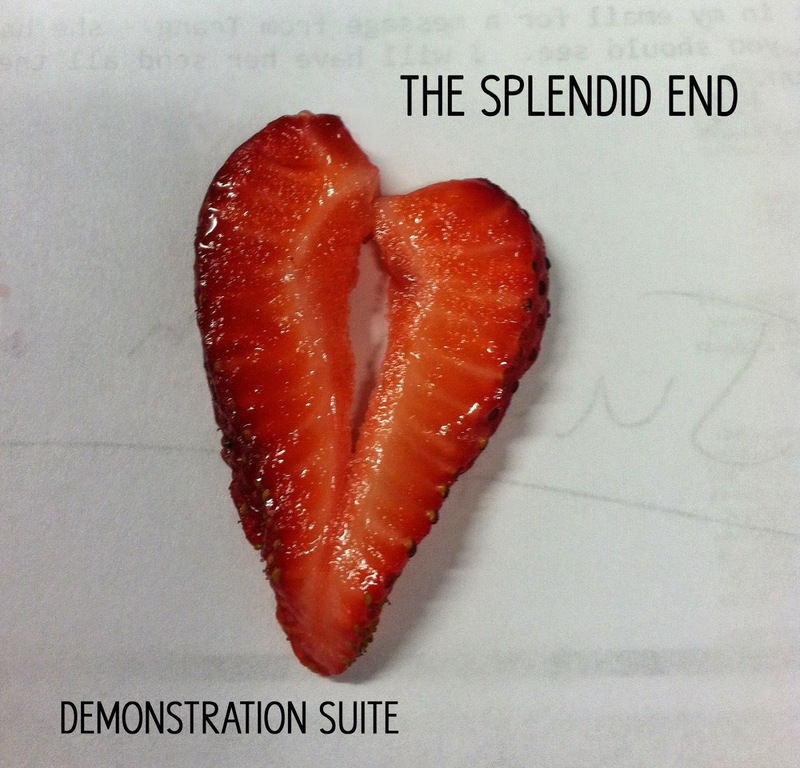 The Splendid End are a band from Minneapolis and this is this latest record Demonstration Suite. It’s thirteen songs that showcase new material and old material from when the band solely comprised of vocalist Amy Buchanan and Guy Low. This record takes elements from the likes of Pixies, Blondie, Pink Floyd, PJ Harvey, The Beatles and sits right in the middle of it. Whine opens the record with a disjointed guitar melody that should be kept away with the likes of WTCHS and the rest of the PERDU gang, but The Splendid End pair it alongside Amy Buchanan’s vocals and it does fit rather well. The track explodes with heavy guitar riffs and full on passion is thrown into the sound before everything suddenly falls back into soft, disjointed melody mode again. It’s a complex listen but a nice way to kick off the album, and does discreetly let you know that you will remain a deer in the headlights for the rest of the record. The Pixies influence is strong on Grey as the instrumental takes everything from Doolittle and makes it it’s own. The dual vocals add an extra touch of eccentricity to the track and once they erupt it’s difficult to hear where this track is going. While it’s not obviously straying away from traditional songwriting, there’s something about it that keeps it firmly out of reach from everything else. The Splendid End have somehow created something original out of so many influences, and I’m confused and I don’t know why. This perpetual confusion leads me into Holkham Beach, which features a lovely piano melody played throughout the track. There’s no sign of strange vocal effects or distorted riffs or anything out of the ordinary, just a lady and her piano. It’s really quite beautiful, until the very end of this track. GOODNESS ME the end of this track comes out of left field, and probably a couple fields after too. A wishy-washy guitar section floats over the instrumental to wrap the piano and the vocals up in a dreamy haze, before slowing everything for the BIG FREAKING FINALE. A HUGE guitar riff fills the waves and my ears with horns and drums accompanying it to give one huge uplifting moment and definitely one of the biggest payoffs of 2014, and definitely sits along other moments such as Daniel Bryan winning the WWE World Heavyweight Championship at Wresltlemania 30, or me finding a tenner in my pocket. The band head into some noise rock with Falmouth Princess which sounds like Swans’ To Be Kind turned accessible. The upbeat drum beat and the grungy bassline makes for a great foundation for the punches of guitars to come in and knock you down in the nicest way possible. It’s four songs in but Demonstration Suite has already touched upon so many different avenues of sound that it’s driven me slightly insane. Saturated is something that The White Stripes could have performed in their heyday, while older cuts like I Can’t Promise A Thing add a much slower paced, relaxed contribution to the record. Adult Entertainment adds in a deathly scream because by this point everything else has been added already and well, this could be the most varied record I’ve heard all year. Demonstration Suite is an extremely disjointed, off-kilter record full of moments that will catch you off guard, but make up for it by being really freaking enjoyable. It takes a couple listens to get into it, but that’s only because there is nothing else that even comes close to sounding anything like this record. It’s a rare discovery of something that’s original, and that has got to be celebrated. For more music reviews, free downloads and I need a lie down, check out Exploding Head Syndrome on Facebook and Twitter.